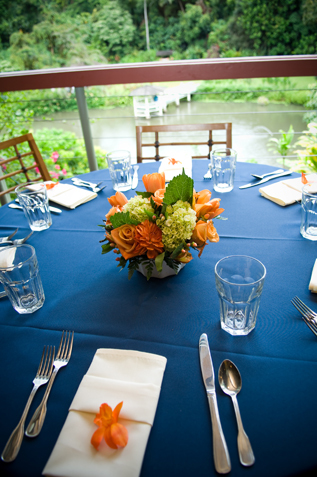 All wedding receptions are held at our award-winning restaurant, Haleiwa Joes Seafood Grill. Overlooking the lush, tropical landscape of Haiku Gardens, Haleiwa Joes is known throughout the islands for serving exquisite meals inspired by its beauty and the bounty that surrounds it. A Hawaiian-style interior, set against the backdrop of the Ko’olau mountains, provides a beautiful setting for your wedding reception. Receptions can be held 7 days a week. For Monday through Saturday exclusive lunch events, the restaurant is available from 10:30am-2:30pm for 50-175 guests. For a Sunday Brunch reception, we can accommodate up to 50 guests. Please click the below link for more detailed information on timing and accommodations. The garden/chapel site fee is $1000.00 for 2 hours of exclusive use of the gardens – this is a requirement for all weddings. 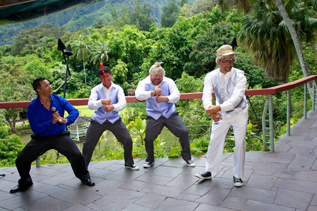 A hired Haiku Gardens Event Coordinator is required to have access to the Tahitian Chapel. Additional garden time is $200.00 per ½ hour. Overtime charges of $200.00 per ½ hour will apply if additional time is utilized other than the contracted time. For morning ceremonies Monday-Saturday, the garden time is typically from 9:30am-11:30pm with a 10:00am ceremony and lunch to follow until 2:30pm. All daytime ceremonies on Saturdays and special dates require both ceremony and reception, and must meet our ceremony package minimum price of $3800. The restaurant site fee is $500.00 for exclusive use of Haleiwa Joe’s from 10:30am – 2:30pm, Monday – Saturday, for 50-175 guests. This includes table set-up, wait staff, plates, silverware, and clean up. Your Haiku Gardens Day of Event Coordinators will generally take care of the placement of wedding favors and centerpieces. The food and beverage minimum is $3,000.00 in addition to the $500.00 restaurant site fee for a minimum $3500.00 total for lunch receptions. The food and beverage minimum includes pupus, lunch, and beverages. Not applicable for Sunday Brunch. All beverages are paid for on event day, based on consumption; all non-alcoholic beverages must be hosted. The cake-cutting fee is $1.00 per person. Hawaii Sales tax of 4.712% will be added to all ceremony and reception costs. A suggested 18% gratuity or a 20% service charge will be added to all food and beverages items. Haiku Gardens is not responsible for the removal and discarding of any decorations brought in from guests or outside vendors. A $150.00 clean-up fee will be due at the completion of the ceremony and/or reception if excessive trash is left behind. The air-conditioned bridal waiting room is for bridal preparations done prior to the ceremony. Arrival time is based on each event. It cannot be used for storage due to security purposes. Please have all items removed from the bridal room promptly after the ceremony. This includes any gifts, clothing, flowers, etc. Haleiwa Joe’s and/or staff is not responsible for any items left in the bridal room. All investments are non-refundable & non-transferable, and will be applied towards your final charges. To secure a ceremony only, a signed contract and initial investment of $500.00 is required. To secure both ceremony and reception, a signed contract and initial investment of $1000.00 is required. Future investments of at least 50% of your wedding package cost and/or specific service cost is required to confirm and secure all services booked through Haiku Gardens. Haiku Gardens will not make any arrangements until payment is made. The remaining balance must be paid in full 30 days prior to your event. Services can no longer be changed. Your guest count is also due 30 days prior to your event. You may increase this count for 2 more weeks, however it may not be reduced after the 30 day deadline. Any remaining balance must be paid in full at time of increase. Pricing of garden rental, menu selections, package pricing and outside vendors are all subject to change without notice. A medley of fresh vegetables served with our homemade ranch dressing. A colorful arrangement of seasonal favorites. Fresh grade A ahi tuna, blackened seasonings thinly sliced and served with wasabi-ranch and pickled ginger. An island favorite! Large Tiger shrimp served chilled with our spicy cocktail sauce and fresh lemon. An assortment of sliced Cheddar and Pepper Jack Cheeses, presented with grape clusters and strawberries. Fresh tomatoes and basil tossed with an olive oil, balsamic reduction. Served with French baguettes. Jumbo shrimp dipped in a light tempura batter with sweet coconut. Fried and served with a plum dipping sauce. Fresh Ahi marinated and flash fried. Served with a sun-dried tomato aioli. Boneless Korean style beef, marinated in our sweet soy-sesame sauce. Lightly marinated and char grilled with your choice of Teriyaki, Kalbi, or *Garlic rub. Tender strips of chicken marinated in our own teriyaki sauce then char grilled to perfection. Sushi style, rolled in tempura and deep-fried, served crispy with wasabi ranch. Haleiwa Joe’s famous mushrooms sautéed in our garlic-herb butter. Applicable taxes will be added. A gratuity of 18% added to all parties. Prices for Keiki (3-10 years) are half of menu price, 2 and under are free. Prices and menu items are subject to change.